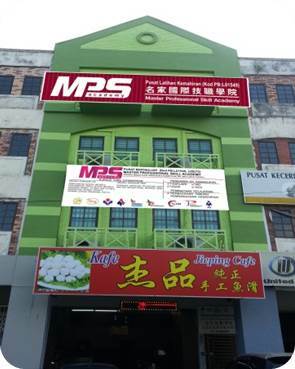 MPS Academy Sdn. Bhd. was formed in the year of 1988 with the registration as Pusat Persolekan dan Kosmetik May May,focusing on the Technical & Vocational Education and Training to cater the needs of the industry, particularly the fundamentals of“train & place“. The institution was then accredited by Department of Skills Development (DSD)/Jabatan Permbangunan Kemahiran (JPK) as the Accredited Centre in the year of 2002. JPK is the government agency responsible for promoting and coordinating strategies and skills training programmes in line with efforts to reinforce skills. Through the Skills Malaysia agenda announced under the Economic Transformation Programme (ETP) by the Prime Minister on 11th January 2011, the government aims to achieve 50 per cent of highly-skilled workers by 2020. To augment this effort, the government has recognized the Malaysian Skills Certificate (SKM) for the purpose of entry into 13 public service schemes. Our objective and business branding is to create professional skills for the industry needs. Hence, our institution provides the empowered profession with others related skills and knowledge as producing more holistic occupation, particularly the professional enhance knowledge and skills to trainees. At MPS Academy, our core competency is to provide unique education system to our students. We have expert tutors who possess more than 10 years’ experience in related field. The high competency and capability human capital enable MPS Academy provides competitive courses, as a large business branding fundamentals, enrolment in our course and programs, our institution can ensure trainees are trained and empowered with a lot of specialized skills from our tutors. Treat your colleagues, family, and friends with respect, dignity, fairness, and courtesy. Pride yourself in the diversity of your experience and know that you have a lot to offer. Commit to creating and supporting a world that is free of discrimination, harassment, and retaliation. Have balance in your life and help others to do the same. Invest in yourself, achieve on-going enhancement of your skills, and continually upgrade your abilities. Be approachable, listen carefully, and look people directly in the eyes when speaking. Be involved, know what is expected from you, and let others know what is expected from them. Celebrate, relive, and communicate your successes on an on-going basis.